SYNCRO.ORG is dedicated to the enjoyment and preservation of the 4WD Volkswagen T-3 Syncro, a unique and wonderful vehicle made in limited numbers from 1985 to 1992 by Volkswagen, Styer Puch, and, for campers, Westfalia Werke. 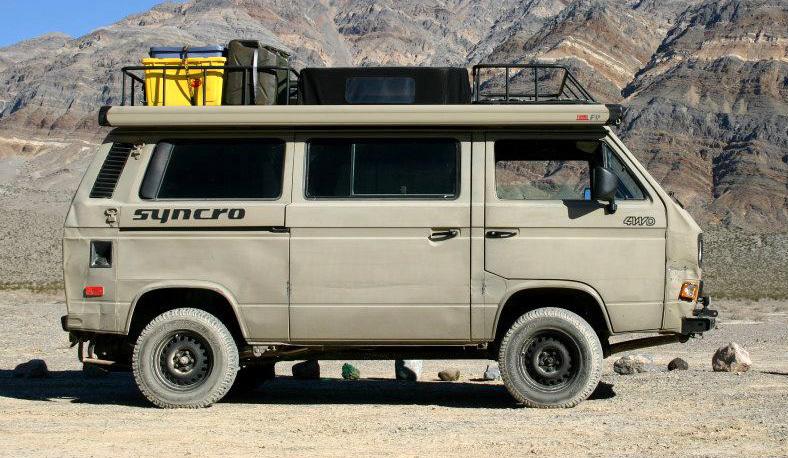 The Syncro Westfalia performs well off road, offers comfortable living quarters and has great character. Can you say Adventure! This site is not affiliated with the Volkswagen or Steyr-Puch or Westfalia Companies. SYNCRO.ORG began, humbly, in 1997 as a "TO DO" list scratched out on a piece of paper. The list was later converted to HTML for use in coordinating a wish-list of syncro projects. That document was later converted into a single-page website featuring the upgraded syncro and its many enhancements. It was posted to the web in the spring of 1998. Bit-by-bit, pages, photos and links were added until SYNCRO.ORG evolved into its current form. Beginning in the spring of 2000, SYNCRO.ORG began putting on an annual gathering of syncronauts near Hollister, Clalifornia, for a weekend of camping, off-roading, and all sorts of related fun. The event is aptly called SYNCRO de MAYO, since it is held in early May, when the weather is nice. The VW T3 Syncro itself has an interesting history. Simon Holloway does a fine job of summarizing that history in his piece The Syncro Story. The best part about SYNCRO.ORG is that it is primarily a compilation of the work of the community. Submissions to SYNCRO.ORG are welcome and encouraged. Please contact us via the Contact Page. and to fostering an international Syncro Community.